Here's my card for the current My Favorite Things Wednesday Sketch Challenge. 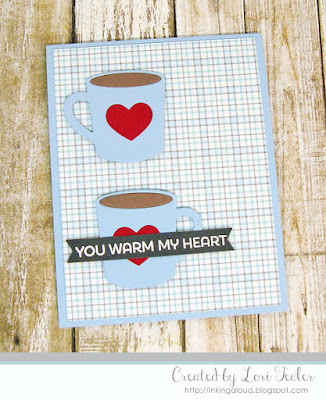 The Die-namics Hot Cocoa Cups dies take center stage here on on my design. I used the dies and cardstock scraps to create a pair of mugs, then adhered the mugs to a gray and blue plaid patterned paper panel using foam tape. The "you warm my heart" sentiment from the Perk Up stamp set was stamped in white pigment ink on a gray fishtail flag strip, then heat embossed in white for a bold pop. I used more foam tape to position the sentiment strip over the bottom mug. The finished panel was adhered to a light blue card base to match the mug duo.